Plastic tracks could reduce the cost of Olympic “sliding” events and make the sports more environmentally friendly and accessible. (Inside Science) -- The sledding events are among the fastest, most compelling to watch, and, for participants, most bracing of any in the Winter Olympics. 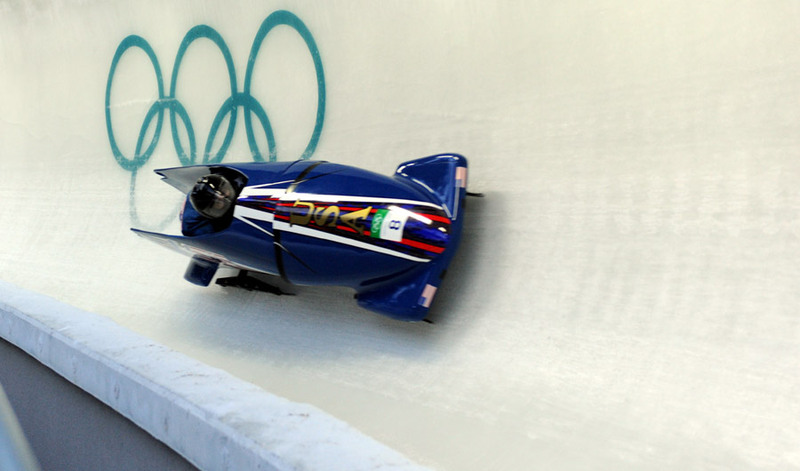 Competitors in bobsled, luge and skeleton often hurtle down an ice-covered track at over 75 miles per hour and experience forces up to five times stronger than gravity’s when they power through the track’s 14 to 20 banked corners. But the number of individuals who can qualify for these events is limited. Sledding tracks are hugely expensive to build and maintain, and are generally located far from population centers. So only individuals who live close to a track -- or can afford to visit one frequently -- can undertake the training they need to perform at an elite level. That complicates the International Olympic Committee’s efforts to increase its appeal to younger athletes and attract competitors from warmer countries to the Winter Games. Researchers at Purdue University in West Lafayette, Indiana, and the Federal Polytechnic School in Lausanne, Switzerland, known as EPFL, have a solution: Substitute plastic for ice as the tracks’ running surfaces. “The idea is the use of new material for the benefit of sport,” said Jan-Anders Mansson, director of Purdue’s Composites Manufacturing and Simulation Center. “I commend any attempt to reduce costs of track build and push more sustainable and environmentally friendly designs,” said Kristan Bromley, a British former Olympic skeleton slider whose company, Bromley Technologies Ltd., manufactures sleds and other sports equipment. Swedish-born Mansson, who moved from EPFL to Purdue last year, recently completed a three-year study on the use of a variety of the common polymer polyethylene as the substitute for ice on sledding tracks. The study showed that an ultrahigh molecular weight polyethylene -- a very hard form of the common plastic consisting of more than 100,000 groups of two carbon atoms and four hydrogen atoms -- closely mimics the friction created on ice by stainless steel sled runners when the plastic is covered by a light mist of water. The polyethylene also has much the same speed profile as ice. On a track, it would allow sleds to pick up enough speed within the first 100 yards to ensure the fastest performance further down the track. Polyethylenes come in several varieties, from supermarket bags to low-friction, low-wear types used in artificial hip joints and the bottom surfaces of racing skis. “If you make it with high molecular weight, you get fantastic wear resistance and low friction,” Mansson explained. In laboratory tests, the team tested the interaction between sled runners and the material. They found that the grooves made by the runners, no more than a tenth of a millimeter wide, quickly healed themselves. Testing showed no deterioration of the track after 1,000 simulated bobsled runs. To ensure that sledders reach top speed as quickly as they do on ice, the researchers simulated increasing the slope of the initial section of the plastic track. They found that the polyethylene track best mimicked the performance of traditional ice tracks if covered with a mist of water. As the Purdue scientists see it, polyethylene tracks would have three key advantages over the traditional ice: cost, environmental sustainability, and accessibility. The “sliding track” at this month’s Winter Olympics in Pyeongchang, South Korea, cost about $114.5 million to build, and could require about $2.84 million annually to maintain. In contrast, Mansson estimates that a plastic track would cost about $4 million to $5 million, and that maintenance would cost little because it needs no cooling. The research also indicated that plastic tracks could have up to 70 percent less impact on the environment than ice tracks. That would stem mainly from eliminating the cooling system and placing the plastic tracks in locations less vulnerable than out-of-the-way ice tracks to damage by large numbers of spectators. Mansson and Dustin envision plastic tracks consisting of 22 modules that could be temporarily erected in cities for major competitions. There, they would expose sliding events to fresh fans. Dustin agrees. “Studying the steering effect is the next phase of the project,” he said. Bromley also wondered how polyethylene, which notoriously softens in high heat, will react under hot sunlight. However, Dustin pointed out, the high molecular weight and the water mist would ensure a track’s integrity at temperatures up to 100°F. “If you use not ice but plastic that has the same properties, you can have summer sledding, family sledding, and even large events in warm countries,” Mansson said. According to Dustin, the events could appeal to young people in the same way the Red Bull Games and X Games do. The value of new faces in winter sports was showcased in 1988. The Jamaican bobsled team that competed in that year’s Winter Olympics in Calgary, Canada, received worldwide press coverage and inspired the 1993 movie Cool Runnings. This month, three former track and field stars will make up the Nigerian team in the women’s two-person bobsled in Pyeongchang, becoming the first African Olympians in that sport. Plastic sledding tracks could bring more unexpected competitors to the Winter Olympics.